According to research carried out by the Cambridge & Counties Bank adults in the UK are likely to donate annually, an average of £110 per person. In Greater Manchester that would mean nearly 2,000,000 people giving £220Million each year. Additionally, the UK Civil Society Almanac 2012 tells us that these charities have a combined income of around £37bn. Blimey! That’s a hell of a lot of dosh. But did you know that it’s estimated that 80% of all those charitable donations made by local people leave the area and that there are around 160,000 charities in the UK all hungry and eager to attract those donations. As you might guess, it’s the big household names like Cancer Research UK, NSPCC, Oxfam and the RSPCA with annual incomes above £10m that mop up over 80% of all the donations. In fact the top 1.1% of these large charities get 68% of everything raised. Double blimey! There’s no doubt about it Charity is big business and don’t get me wrong all these charities (well nearly all) do amazing, valuable and often lifesaving work, but at Forever Manchester our job is to fund and support the grass-root, hyper local, often un-constituted community projects…. and these guys don’t even figure in the top 160,000! This is why we’re really excited to be launching Forever Manchester Week. It’s quite simple really, local community groups can’t compete with the big boys, with their multi-million pound marketing budgets, celebrity endorsements, all-day TV spectaculars and teams of highly paid fundraisers. 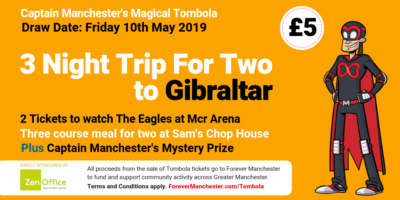 So here’s what we want to do – we’re enlisting your help to create our own massive Mancunian fundraising spectacular – FOREVER MANCHESTER WEEK – a week of fun, noise and fundraising to celebrate the amazing work that our local community groups do. A week to thumb a big red nose at everyone else and say this is Manchester we do things differently ‘round ‘ere. We guarantee that 100% of all the money raised will stay within Greater Manchester and support the neighbourhoods and communities that make this place so great. So come on fellow Greater Mancunians, get involved, do your bit and who knows if we make a success of it we could do it every year and get our own Sir Lenworth Henry, CBE…or not? !